Sun had a really rough night. Earth told sun not to go to that party, but Sun didn’t listen. Just as sun was leaving the house, Earth said don’t take the green pills from Hector, but Sun didn’t listen to that either, mainly because Sun was drunk of her mind, and when Hector came around, her defenses were down, and was an easy sell on the green pills. Then, it was a blur for Sun. In fact, it was a blackout night of mayhem she can’t even remember. But, Sunday morning came and she had obligations in the AM. Earth stayed home, went to sleep at a decent hour and is obviously chipper, sipping a cuppa coffee. I’m betting Sun doesn’t quite get there this morning. 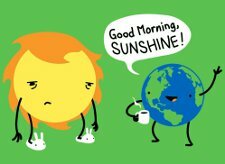 So, that’s why you should get the Good Morning Sunshine T Shirt…obviously. Plus, stick figure legs and plush bunny slippers. Snorg Tees oftentimes likes to give you some adorable stuff to put on your chest. Enjoy!